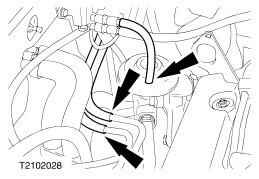 If necessary, use remover 303-397 when removing coolant hoses and vent hoses. Release pressure in fuel system. NOTICE: When the engine is hot there is a risk of scalding. 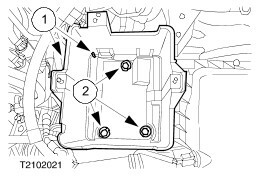 Open the coolant expansion tank. Detach the heat shield from the catalytic converter. 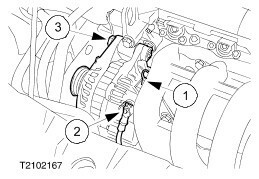 Remove the coolant pump pulley and the drive belt idler pulley. 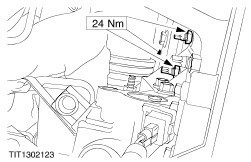 Loosen the bolts and pull the power steering pump back by 10 mm. 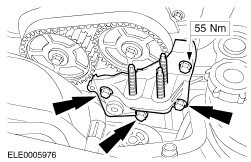 Remove the bolts from the timing belt covers. Reinstall the drain plug after draining. Detach the clips and unhook the accelerator cable. Twist out of the bracket. Detach / separate the connectors. Detach the engine wiring harness connector. 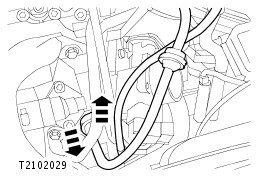 Detach the coolant hose from the coolant outlet housing. From the coolant outlet housing. To the coolant expansion tank. 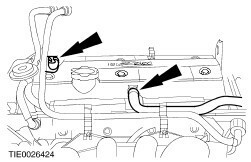 Detach the vacuum hoses from the throttle body. 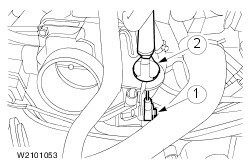 Detach the vacuum hoses from the exhaust gas recirculation valve (EGR valve) (if present). Remove the exhaust manifold heat shield. 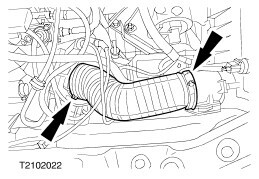 Detach the exhaust manifold from the catalytic converter. 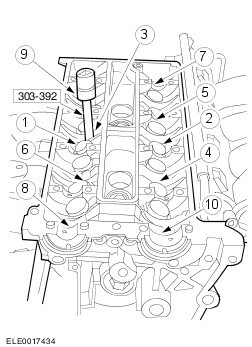 Remove the three lower intake manifold bolts from the cylinder block and detach the oil dipstick tube. Remove the cover plate from the cylinder head cover. Detach the positive crankcase ventilation hose (PCV hose). Unclip the carbon canister vacuum pipe bracket. 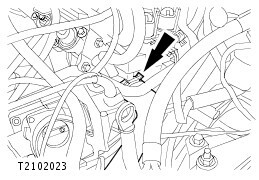 Do not pull on the cable when detaching the spark plug connector. 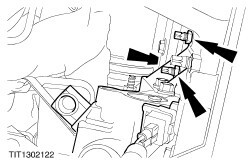 If necessary, detach the connector from the ignition coil to avoid bending the cable. 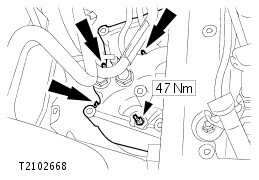 Turn the spark plug connector slightly before detaching it in order to loosen the seal. Detach the spark plug connector in line with the spark plug axis. 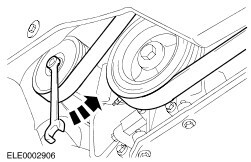 Do not damage the cylinder head cover gasket as this cannot be renewed separately. 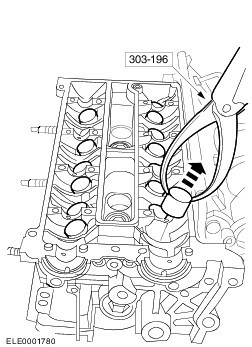 Remove the cylinder head cover vertically upwards. 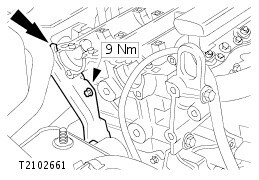 Detach the spark plug connectors. 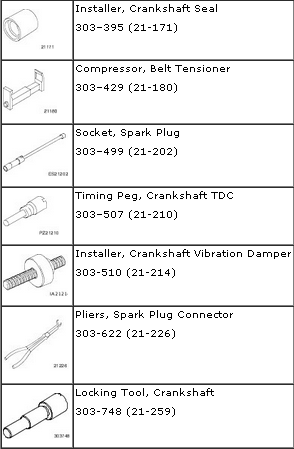 Use special tool 303-622 for angled spark plug connectors. 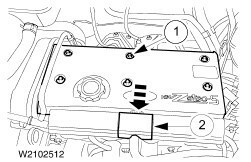 Remove three bolts of the timing belt upper cover. 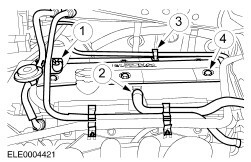 Detach the PCV hose and the fuel supply and return lines from the cylinder head cover. 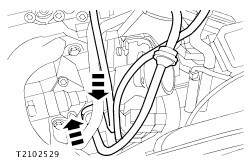 Do not pull on the cable when detaching the spark plug connector. If necessary, remove the ignition coil plug to avoid bending the cable. 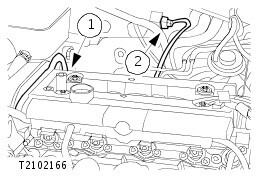 Turn the spark plug connector slightly before removing it, to loosen the seal. 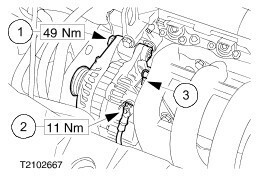 Disconnect the spark plug electrical connectors and unclip the wires from the cylinder head cover. 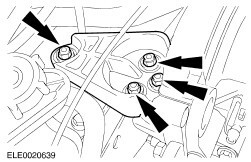 Position a trolley jack with a wooden support underneath the oil pan and jack it up slightly to take the load off the front engine mounting. NOTE: Support the engine with a trolley jack and wooden block. Detach the front engine mounting bracket. Remove the front engine mounting bracket (shown with engine removed). 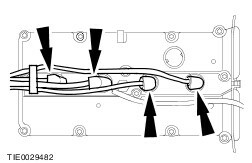 NOTE: When re-using the timing belt, mark the running direction. 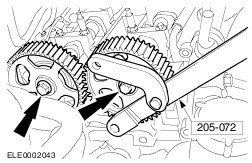 Slacken and remove the timing belt. 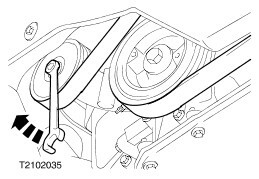 Compress the timing belt tensioner using the special tool. Slacken and remove the timing belt (shown with engine removed). NOTICE: Counterhold using the special tool. Discard the timing pulley bolts. Remove the spark plugs with the special tool. NOTE: Keep the bearing caps in order for reassembly. The identification numbers are located on the outside of the camshaft bearing caps. 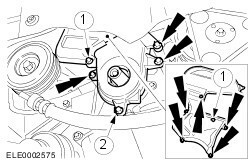 Loosen the camshaft bearing cap bolts one turn at a time until the camshaft is released. Detach the camshaft bearing caps. 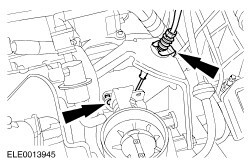 Detach the camshaft oil seal. NOTE: Keep the valve tappets and adjusting shims in order for reassembly. Remove the valve tappets and adjusting shims using the special tool. NOTE: Keep the valve tappets in order for reassembly. 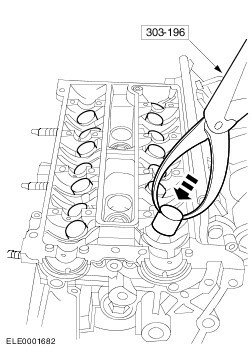 Remove the valve tappets using the special tool. 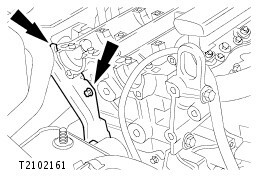 Detach the timing belt cover bracket from the cylinder head (two bolts). 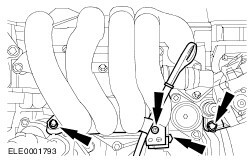 Remove the three lower intake manifold bolts and detach the oil dipstick tube. 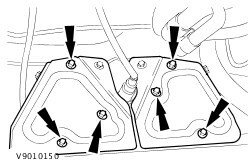 The cylinder head must cool to below 30 degrees C prior to removal. Place the cylinder head on a soft surface. Detach the cylinder head using the special tool. Lift the cylinder head from the cylinder block and put it down on a soft surface. NOTE: Ensure that all mating faces are clean. Set the crankshaft to approx. 25 mm before TDC. 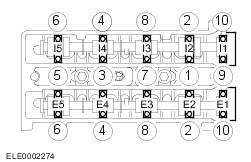 Place the cylinder head on the cylinder block. NOTE: The cylinder head is located by two guide sleeves. NOTE: Used cylinder head bolts can be reused. Install the cylinder head using the special tool. Ensure that the mating faces are clean. 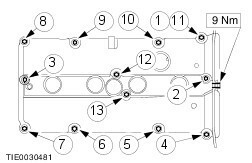 Install the cylinder head, tightening in three stages in the sequence indicated. 3rd stage with special tool 303-174: 90 degrees. 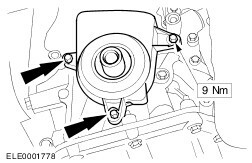 NOTE: Install each valve tappet in the location from which it came. If necessary, change the tappet to adjust the valve clearance. 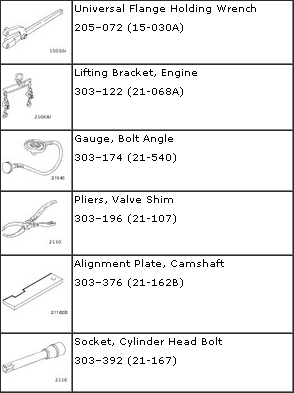 NOTE: Install the valve tappets with adjusting shims in the locations from which they came. Install the valve tappets and adjusting shims. Install the three lower intake manifold bolts and attach the oil dipstick tube. Install the front engine mounting bracket. 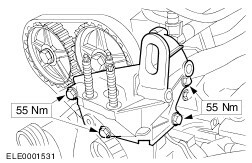 Move the timing belt upper cover into the installation position. Install the front engine mounting. Attach the catalytic converter to the exhaust manifold. Install the exhaust manifold heat shield. 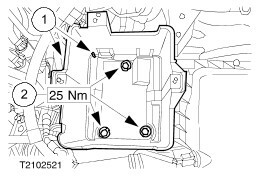 Install the timing belt cover bracket. 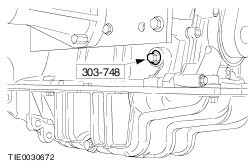 NOTE: The identification numbers are located on the outside of the camshaft bearing caps. 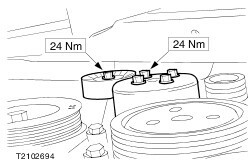 Apply sealer to the areas shown on camshaft bearing cap no. 1 and to the opposite surface on the cylinder head. NOTICE: Install the camshaft with none of the cams at full lift. 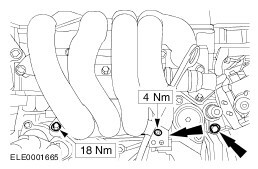 NOTE: The exhaust camshaft has an additional cam for the camshaft position (CMP) sensor. 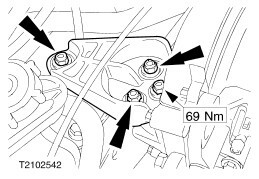 Identification numbers on the camshaft bearing caps. 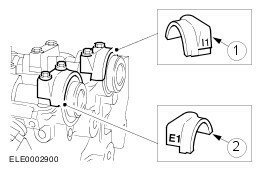 Begins with I1 at the timing belt end for intake-side camshaft bearing caps. 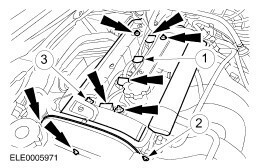 Begins with E1 at the timing belt end for exhaust-side camshaft bearing caps. Fit the camshaft bearing caps and tighten the bolts in three stages. 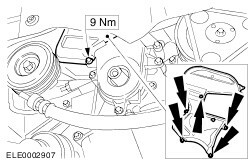 1st stage: Tighten the bolts evenly half a turn at a time until the camshaft bearing caps contact the cylinder head. Check the valve clearance and correct if necessary. Press in a new camshaft oil seal using the special tool. Turn the camshafts to TDC of cylinder no. 1. 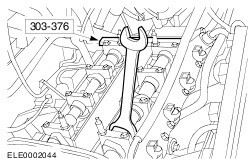 Turn the camshafts at the hexagon with an open-ended spanner until the special tool can be inserted. NOTE: Use new camshaft pulley bolts. Install the camshaft timing pulleys so that it is still just possible to turn them on the camshafts. NOTE: Marked running direction on re-used timing belt. 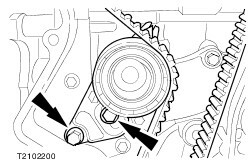 Fit the timing belt working counter-clockwise from the crankshaft timing pulley. Install the timing belt lower cover. 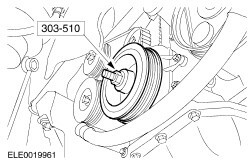 NOTE: Use the bolt removed from the crankshaft pulley/vibration damper. Install the crankshaft pulley/vibration damper using the special tool. Remove the blanking plug and install the special tool. Carefully turn the crankshaft until the crank web contacts the special tool. NOTE: Use a new bolt. Install the crankshaft pulley/vibration damper bolt. Tighten the bolts in two stages. 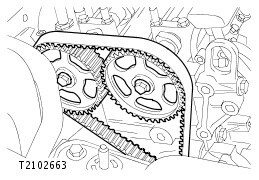 Tension the timing belt (shown with engine removed). Using a 6 mm Allen key, turn the eccentric counter-clockwise until the arrow is in line with the center of the window. NOTE: Do not turn the eccentric when tightening it. Counterhold using an Allen key. Using an 8mm Allen key, tension until the pointer is positioned exactly in the center of the square recess. 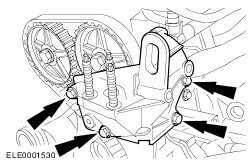 NOTICE: Do not tighten the camshaft timing pulleys against special tool 303-376. 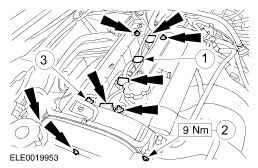 NOTE: Do not turn the crankshaft and the camshaft. 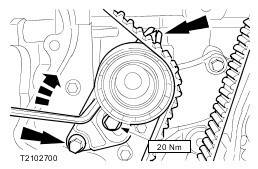 Tighten the bolts of the camshaft timing pulleys. 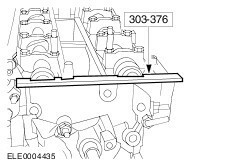 NOTE: If special tool 303-507 cannot be screwed in, turn the crankshaft back counter to the direction of engine rotation by about 20 degrees. 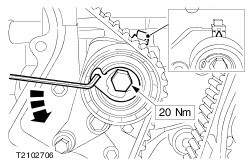 Turn the crankshaft two revolutions in the direction of engine rotation and set it to TDC. Screw in special tool 303-507. 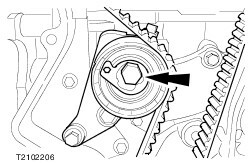 Carefully turn the crankshaft in the direction of engine rotation until the crank web contacts the special tool. Use special tool 303-376 to check TDC position. Remove special tools 303-376 and 303-507. 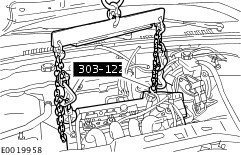 NOTE: Only if special tool 303-376 cannot be inserted. Screw in the special tool. 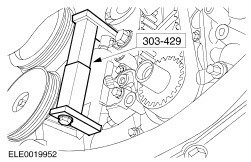 NOTICE: Do not tighten the camshaft timing pulley against special tool 303-376. Loosen the camshaft timing pulley of the affected camshaft, counterholding using the special tool. 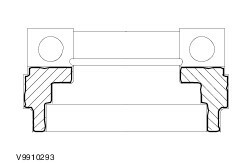 Turn the camshaft at the hexagonal section using an open-ended spanner until special tool 303-376 can be inserted. 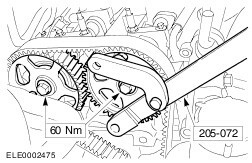 Tighten the camshaft timing pulley; the crankshaft must remain at TDC. 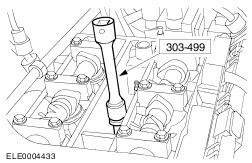 Remove special tool 303-376 and unscrew special tool 303-507. 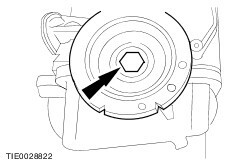 Check the valve timing again in accordance with the previous step. Install the blanking plug in the timing peg bore. NOTE: Apply lubricant to the spark plug threads. Install the spark plugs using the special tool. 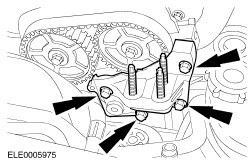 Install the bolts of the timing belt cover. 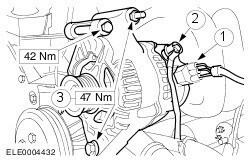 Tighten the power steering pump bolts. 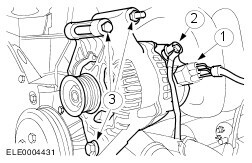 Install the coolant pump pulley and the drive belt idler pulley. Fit and tension the drive belt. 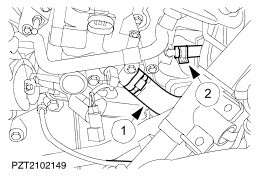 Install the vacuum hoses on the EGR valve (if present). 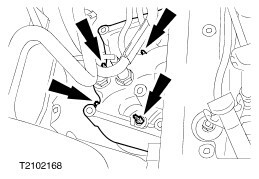 Heater hose to coolant outlet housing. Hose to coolant expansion tank. Attach the coolant hose to the coolant outlet housing. Use a blunt object (e.g. a plastic cable tie) to apply the silicone grease, to avoid damaging the spark plug connector seal. Push on the spark plug connector keeping it in line with the spark plug. NOTE: Coat the inside of the spark plug connectors with silicone grease to a depth of 5 - 10 mm. Attach the nuts and tighten in two stages. 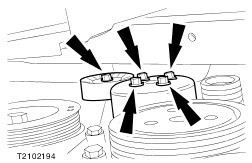 Push on the spark plug connectors until they engage. 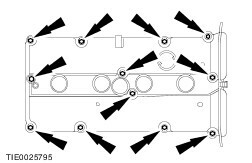 Install three bolts of the timing belt upper cover. Install the cover plate of the cylinder head cover. Clip in the carbon canister vacuum pipe bracket. Clip on the fuel pipes. NOTICE: Make sure that the mating faces are clean and free of foreign material. Attach the cylinder head cover. Screw in bolt no. 1 finger tight. 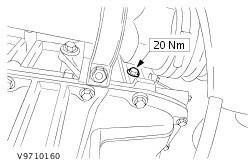 Tighten bolt nos. 2 to 13 in the sequence shown. 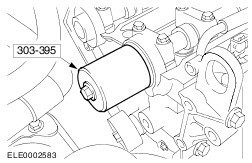 NOTICE: Use suitable blunt object to avoid damaging the spark plug connector seal. Coat the inside of the spark plug connector with silicone grease to a depth of 5 - 10 mm. 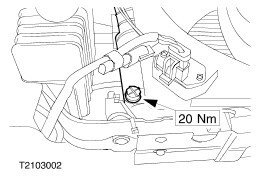 Connect the spark plug electrical connectors and clip the wires to the cylinder head cover. Install the PCV hose and the fuel supply and return lines on the cylinder head cover. Attach the engine wiring harness connector. Install the cylinder head cover plate. Attach the crankcase breather hose and close the wiring harness cover. Screw on the oil filler cap. Hook in the accelerator cable and secure it to the bracket with the clip. Screw the cable into the bracket. Install the oil drain plug with a new seal. Change the oil (incl. oil filter). Install and connect the battery. 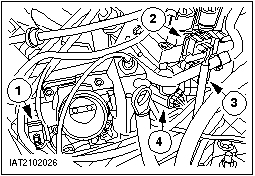 Check the engine and the cooling system for leaks (visual check).